On Tuesday, August 21st, the Fort Collins Landmark Preservation Commission hosted their 34th annual Friends of Preservation awards. Doug Ernest, a former Landmark Preservation Commission member, was one of the recipients. What follows is the introduction I read before Doug received his award. Meg Dunn (Chair of the LPC), Doug Ernest (former Vice-Chair and Acting Chair of the LPC), and Mayor Wade Troxell. He’s also a stickler for following protocol, as, of course, any good librarian would be. 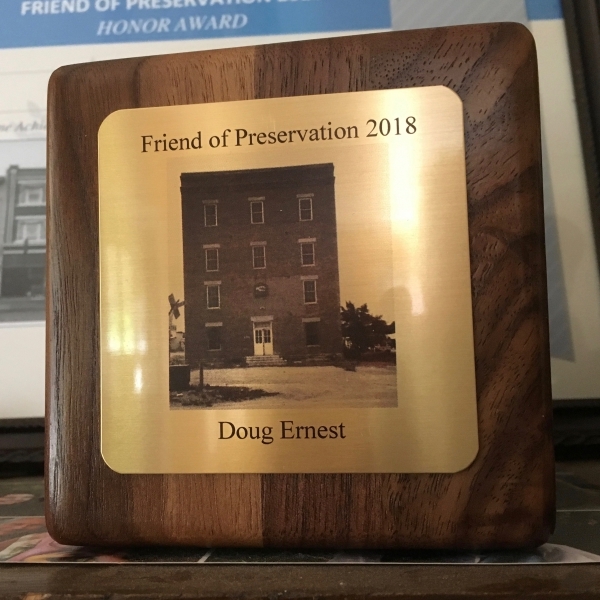 This made him an ideal addition to the Landmark Preservation Commission where Doug regularly made sure we were addressing the issues that we were required to under the code. And we were also able to rely on him to make thoughtful, thorough motions on which we would vote. But serving on the LPC was only one of the ways that Doug has given of himself for the cause of local history. 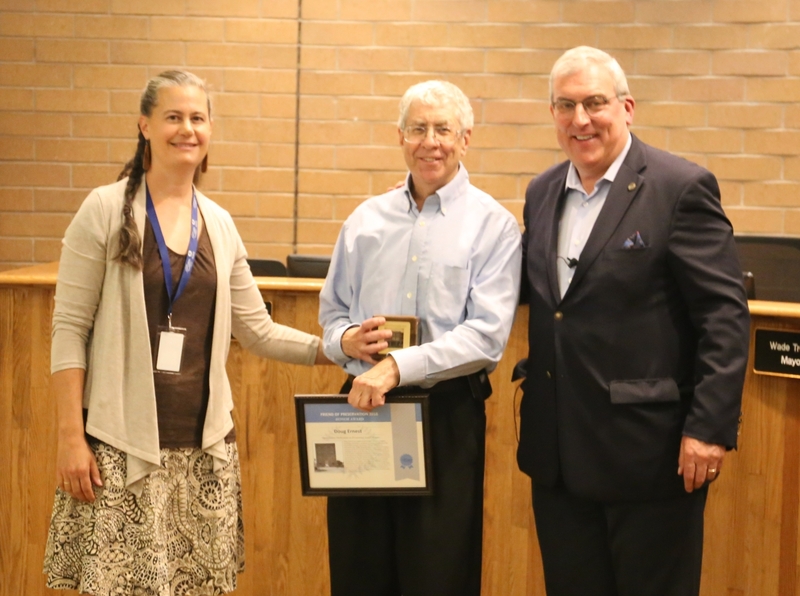 Though he retired from his official duties as librarian in the CSU libraries in 2008, he quickly threw himself into using his skills and passions to serve in areas that increase the overall body of knowledge of history in Fort Collins and northern Colorado. He’s volunteered with the Archive at the Fort Collins Museum of Discovery, the Poudre Landmarks Foundation, and the CSU Water Archive, and he was an early and eager supporter of the county-wide preservation organization, Historic Larimer County. One project that Doug has been deeply involved in is researching the Harmony Mill, originally called the Farmers Mill. The building stands at the corner of Lincoln and Willow just across from Ranchway Feed. After going through the careful, thorough research that Doug is particularly known for, I think it’s probably safe to say that he knows more about that building than the builders, every tenant, and every owner combined. It’s the building that’s been engraved onto Doug’s award. And the body of knowledge that we now have about that building is an excellent example of the type of contributions that Doug has been making to our community since at least 1974. So, Doug, we thank you today for your Outstanding Dedication to Preserving Our Local History. Each awardee received an engraved wood block.